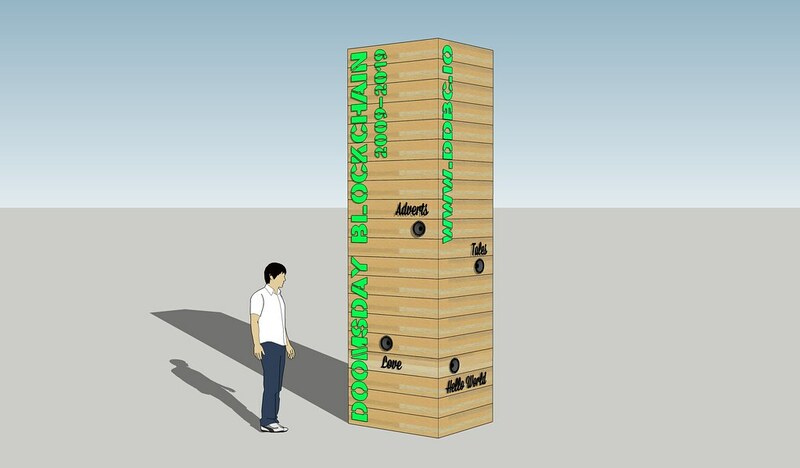 The Doomsday Blockchain is a totem-style memorial to the 21st century that broadcasts excavated texts hidden within the blocks making up the Bitcoin blockchain. Standing at an imposing four metres high, the totem’s eight speakers broadcast the mined texts, which are sorted by theme and rendered electronically into speech. These texts embedded in the blockchain by people around the world include marriage vows, memorials to the dead, expressions of faith, advertisements, and more. Together they create a cacophonous representation of contemporary life through a mysterious new medium – much as the Domesday Book resulted in a totem to its time via the medium of a census. To create Doomsday Blockchain, Collusion supported DDBC through a 12-month programme of research and development, including connecting them with key partners. The piece builds on the work of Messages from the Mines, an open source project that excavates and archives custom messages permanently embedded in the Bitcoin blockchain. Doomsday Blockchain is a collective of artists – James Stevens, Daniela Boraschi, Christian Nold, and Alexei Blinov – who have come together to explore the phenomenon of the blockchain as an emerging technology that could profoundly affect how resources are transacted, shared, or recorded.